You need someone to fab so rear window louvers. I was lucky enough to get some free rear end adjustments by someone who "wasnt going too fast" at a stoplight! Luckilly my 8 year old and i are fine aside from the bumper and the half can of monster that ended up on my dash and windshield. Marlaman - Glad you and your kid are unhurt! Freezing cold weather belt squeaking, and 103800 miles on the odometer, made me a bit paranoid so I replaced both the serpentine belt and tensioner. Didn't realize how easy that was to do. While I was already working in my unheated garage, I also replaced the front brake pads and rotors. Pads are Akebono Performance (GG rating), rotors are Wagner E-coat (I'd like to see how they do for the next few winters). I've bedded them in and I have to say that so far, the pedal feel and and perceived grip/stopping power has greatly improved. And no more belt squeaking! I'm glad you're both alright, I can't comprehend crashing into somebody, finding out they had a child in the car, and then sitting there making excuses for myself. 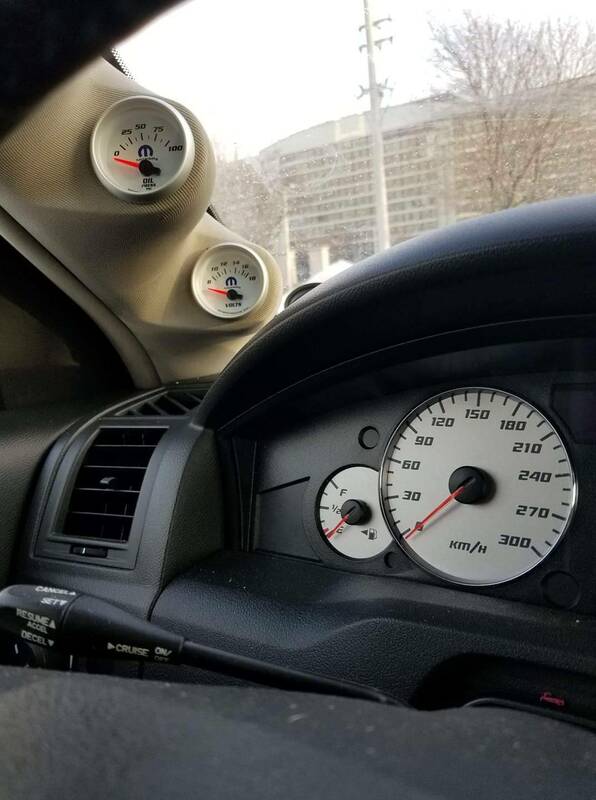 Installed 2nd of 3 gauges. I did a compound and polish after a few years. Since its a 2006 I don't go too hard to get out the deeper scratches, I just remove light marring over the years and jewel the finish to make it look brand new again. I didn't have any swirls to remove after improving my washing process. I got a few holograms but I am pretty sure that its just from the sealant. It comes off after the first wash.
Last edited by BM_SRT; 02-21-2019 at 04:46 PM. Geeze man she looks beautiful, a nice clean black 300 SRT8 is just a classy looking ride. Sooooo nice, got me over here drooling. Thanks! Ill add one more with the new quad tips on. Trust me, black only looks good for a week or until it rains once and the road dirt is deposited. No never get rid of the magnum and just do the 300 front end conversion! Ha! Trust me I've thought about it, the 300 front clip and the Euro spec 300 estate rear bumper cover...but honestly it's the side profile of the big bodied 300 sedan that appeals to me. It feels like Mercedes built their own modern take on the iconic 1965 Lincoln Continental, the big, sinister, Las Vegas mob boss car. But no, the Magnum is here to stay, three car seats, a double stroller in the rear, the wife and I have more than enough space up front, and I still have plenty of room for luggage in the rear. To top that off I can always add a trailer hitch and finally install my OEM roof rack and there isn't much more I could need in terms of practical carrying ability...while still having that big Hemi roar. Well short of spending $80k on a Durango SRT8. Last edited by Tikibeast; 02-22-2019 at 12:16 PM.